These proceedings demonstrate the increasing interest and importance of contact mechanics and wear to the railway industry. The 27 contributions succeed in sustaining a balance between mechanics and metallurgy, theory and practice, and will be of considerable interest to those engaged in research, as well as practising engineers. Stress Analysis. Plastic flow and shakedown of the rail surface in repeated wheel-rail contact (A.F. Bower, K.L. Johnson). Effects of non-linear kinematic hardening on plastic deformation and residual stresses in rolling line contact (D.L. McDowell, G.J. Moyar). Analysis of edge effects on rail-wheel contact (M.T. Hanson, L.M. Keer). Contact region fatigue of railway wheels under combined mechanical rolling pressure and thermal brake loading (R. Lundén). Rolling Contact Fatigue. 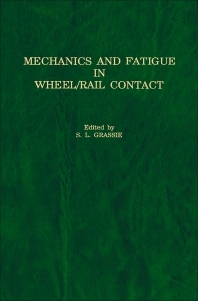 The effect of metal removal, steel cleanliness and wheel load on the fatigue life of rail (R.K. Steele). Investigation of rolling contact fatigue in a head-hardened rail (V. Dikshit et al.). The early detection of rolling-sliding contact fatigue cracks (J.E. Garnham, J.H. Beynon). An analysis of the thermal contributions to railway wheel shelling (G.J. Moyar, D.H. Stone). Rolling contact fatigue in railway wheels under high axle loads (P.J. Mutton et al.). Corrugation. Surface analysis of corrugated rail treads (H.G. Feller, K. Walf). Rail corrugations: analytical model and field tests (E. Tassilly, N. Vincent). The formation of wear patterns on rail tread (K. Hempelmann et al.). Investigation of rail corrugations on the Baltimore Metro (D.R. Ahlbeck, L.E. Daniels). Wheelset-track resonance as a possible source of corrugation wear (W.F. Hayes, H.G. Tucker). Effects of vibration system and rolling conditions on the development of corrugations (Y. Suda). Materials and Wear. Wheel-rail rolling contact theory (J.J. Kalker). Tribological studies on adhesion phenomena between wheel and rail at high speeds (T. Ohyama). Factors of wheel flat occurrence and preventive measures (N. Kumagai et al.). A finite element and fatigue threshold study of shelling in heavy haul rails (A.K. Hellier et al.). Shear mode crack growth and rolling contact fatigue (P.E. Bold et al.). Metallurgical improvement of rail for the reduction of rail-wheel contact fatigue failures (K. Sugino et al.). Wheel-Rail Profiles. A design methodology for wheel and rail profiles for use on steered railway vehicles (R.E. Smith, J. Kalousek). Prediction of wheel profile wear (T.G. Pearce, N.D. Sherratt). Development of freight car wheel profiles - a case study (J.F. Leary et al.). Design of rail head profile with full use of grinding (Y. Sato). An optimization technique to minimize rail contact stresses (R. Smallwood et al.). General discussion. Author index. Subject index.